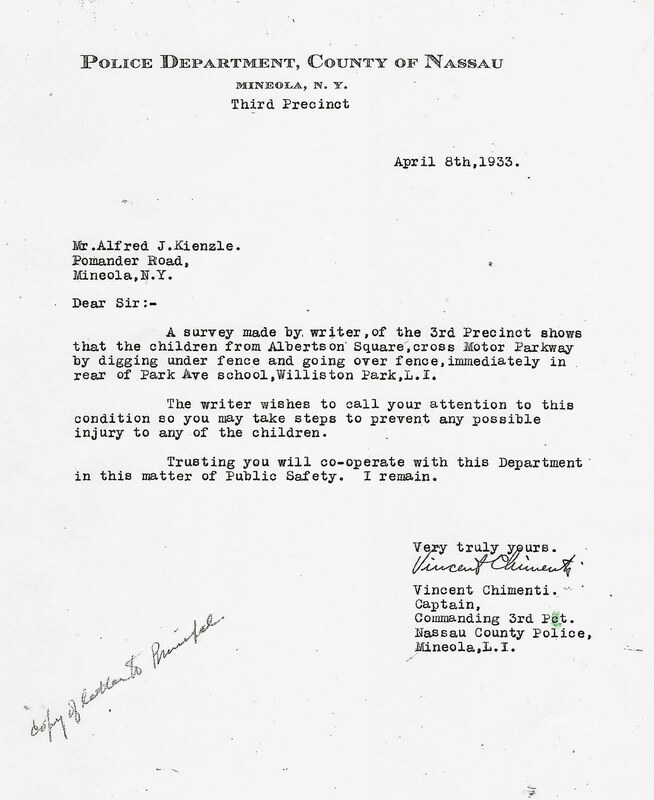 In the late 1920s, a Williston Park public school was built adjacent to the Motor Parkway. 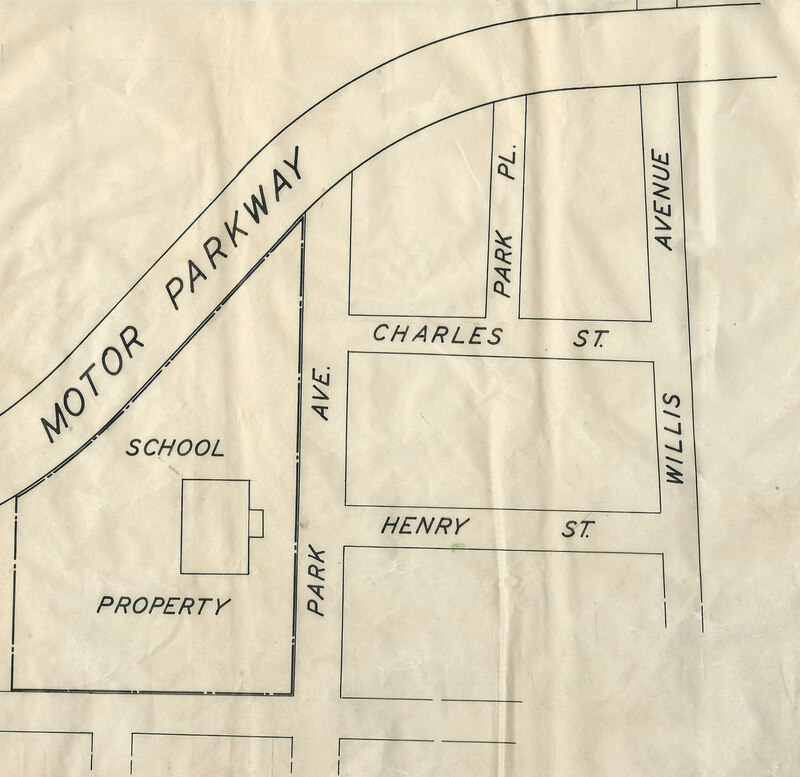 The Park Avenue School was located just west of Willis Avenue, Apparently Searingtown home owners living north of the Motor Parkway complained that the road was a hazard for their children who walked to school. 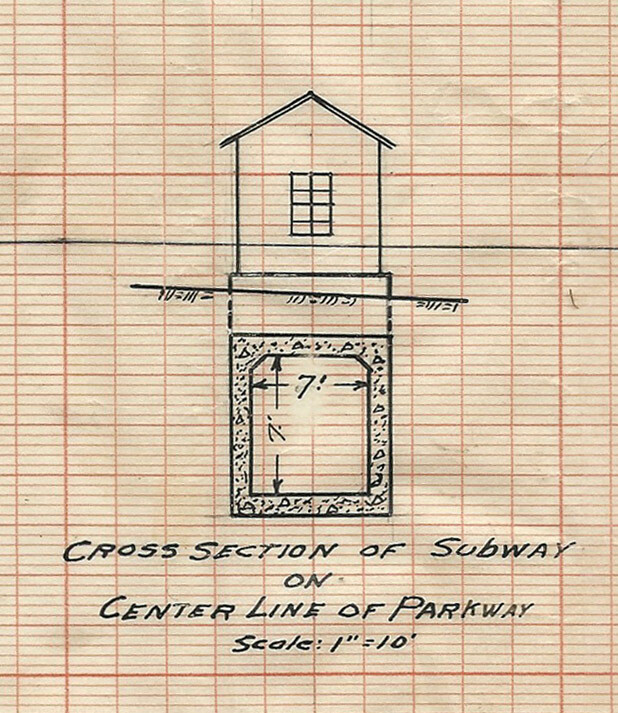 As a result in June 1929, the Motor Parkway proposed a 100-foot footbridge or subway to cross the Motor Parkway. 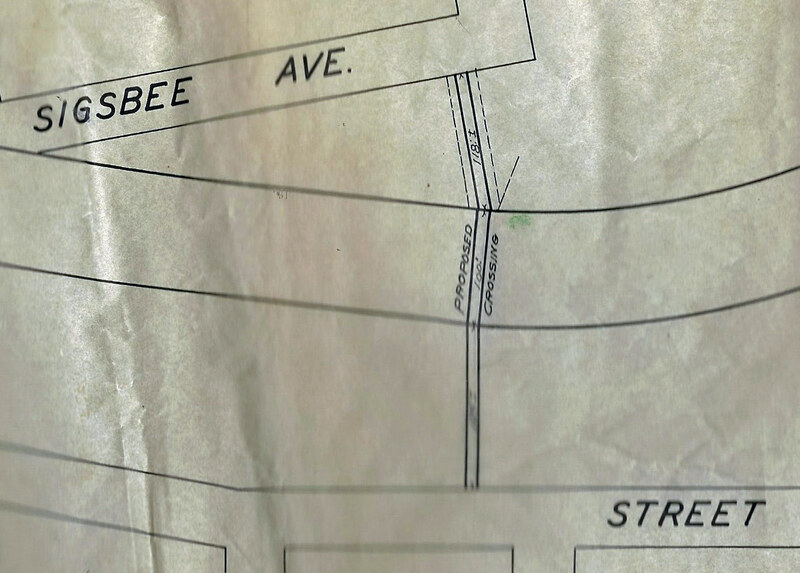 The crossing was located from Sigsbee Avenue in Albertson to William Street in Williston Park. 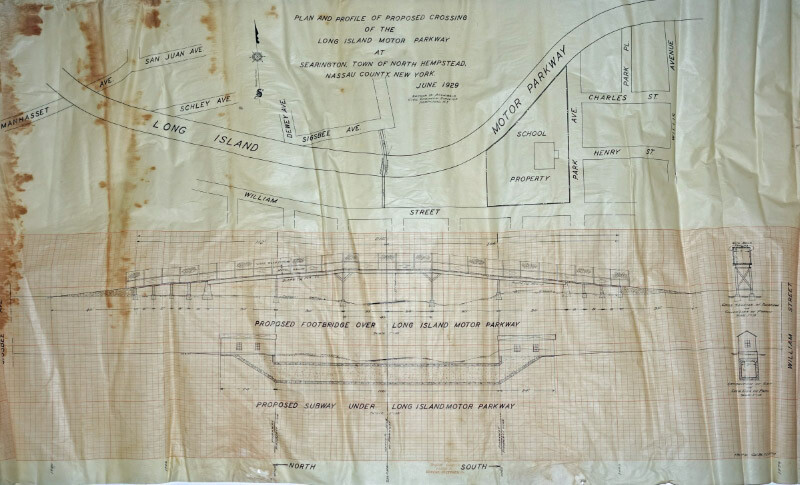 The footbridge and subway were never built. The Park Avenue School was later taken down and replaced with homes. Without the footbridge or subway, the problem of children crossing the Motor Parkway continued until it closed in 1938. Courtesy of Bob Valentine and Al Velocci. 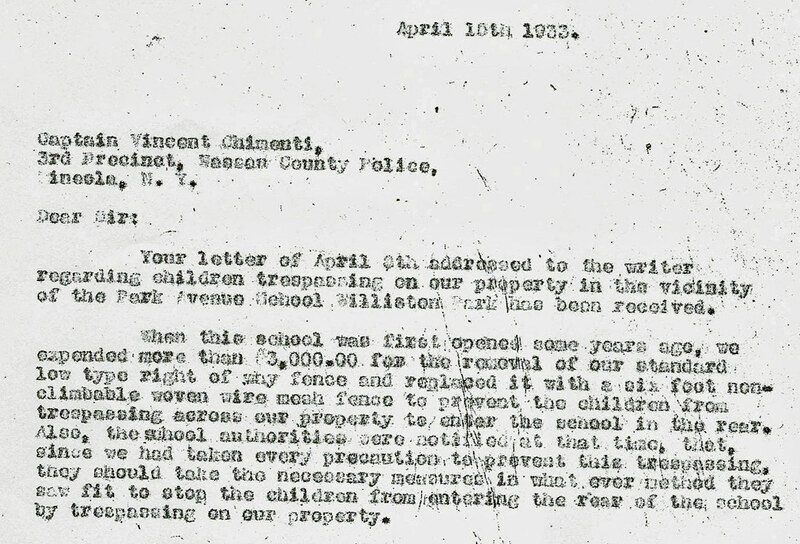 General Manager Alfred Kienzle noted that the Motor Parkway had built a special six-foot "non-climbable woven wire mesh fence to prevent the children from trespassing across over property to enter the school in the rear." Courtesy of Bob Valentine and Al Velocci. 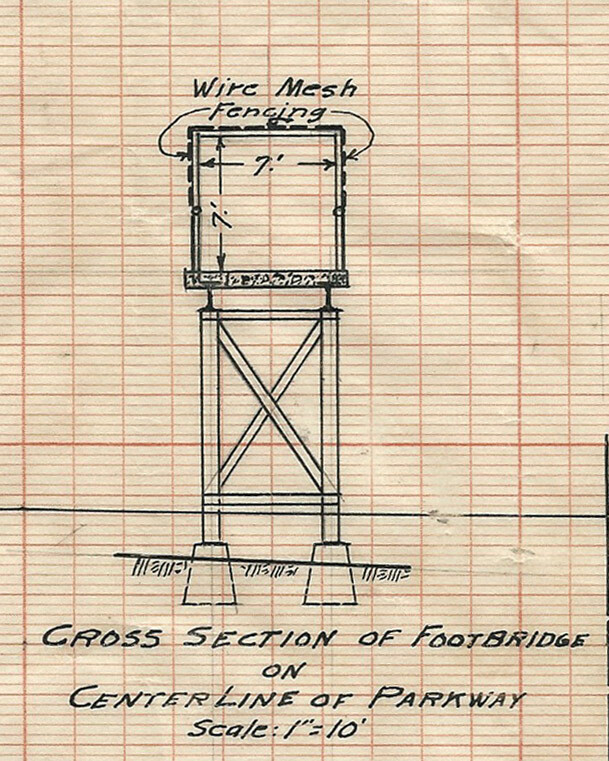 Building a footbridge sounded a whole lot easier ( and less costly ) than tunneling under the roadbed. For whatever reason, neither came to be. Seems like the Captain was forced to address the letter, and already knew what the response was going to be. Going by the sketches, the ground formation looks to be quite uneven at and around the LIMP ROW. Like the roadbed was formed to the land rather than the land being leveled out and sloped on both sides for drainage. I recall viewing a sketch of the LIMP between Clinton Rd and Old Country Rd displaying cesspools/drywells, for road drainage collection I guess. Maybe there were pools and wells in this area, too. The bridge or subway would of connected Williston Park and Albertson. This section of Albertson and Williston Park is located in the Herricks school district. Searingtown is located west of present day Searingtown Rd. Great STUFF…...CONGRATS for all this wonderful work!!!! I live on San Juan Ave in Albertson since 1972. My home is just a few hundred yards west of where this bridge was proposed. I used to know the old resident at 111 Sigsbee. He told me he moved into that house in 1926. (A rather large new construction home replaced this old home within the last 15 years.) The LIMP ran just outside his back door. He used to tell me how there was nothing but open farm fields all the way to Hillside Ave back then. If this is true, and his home was built by 1926, then the proposal would have to have been just east of his property. Since his house would have already been standing. The Nassau Co property site only lists the construction date for the current newer home. I could not use their on-line portal to verify when the original home on the site was built. The previous resident at 121 Sigsbee told me he was offered a triangular piece of property, owned by Nassau County that ran on the south side of Sigsbee from his home to the corner of Dewey Ave. The county offered it to him for $500 on or about 1961, or the time that Nassau decided to sell the LIMP right of way to home owners along Sigsbee & Schley Ave on the North, and William Street on the south side. He did not buy the property because he was advised he would never be able to build on it. The eventual owner land filled the property and was able to build a home at 125 Sigsbee Ave. He basically buried over the LIMP to do so. Eventually, in 1986, a home was built at 27 Sigsbee Ave. Before that a couple of standard height cement LIMP posts stood on that property. They were not anything out of the ordinary as described in the letter you posted about a 6’ barrier. Growing up along there in the 1970’s, and playing manhunt games in the area frequently I never once recall seeing any remnants of a large fence structure. Of course, by then, suburbia was taking over, and by no means does that mean it was not there. I never spoke to the old timer there about any fence out behind his home. Or if I did, I certainly do not remember. I know my next store neighbors were a bit older than me. They went to the Park Avenue elementary school in the early 1960’s. Every day, they told me, they walked out behind our homes onto Schley Ave, then the LIMP, and walked up the LIMP to school. They said it was all open back then. 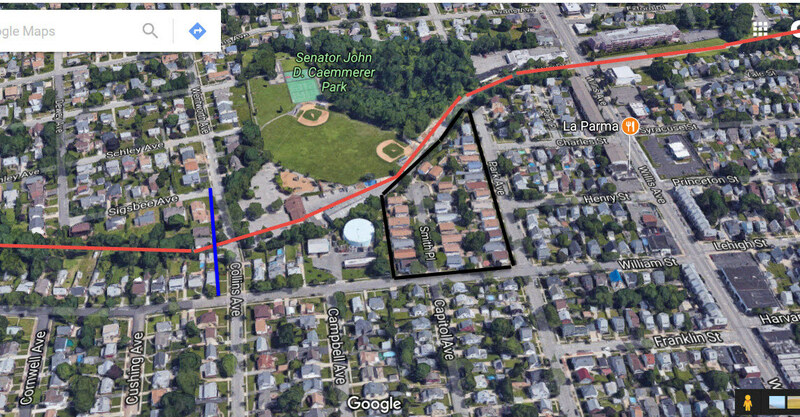 Anecdotally, I was told it was not until the newer homes were built on the former LIMP right of way at the bottom of the dead end street on Schley Ave did anyone begin to fence in the LIMP property and shut it down as a regular waking path. In the fall of 1974 I went back behind a friends home near Sigsbee & Dewey to dig up some worms for a fishing trip. I crawled up this small hill and began to dig. Just a foot away was some ‘sidewalk’ grown over in the woods. It was the first time I noticed a piece of the Parkway. By the following summer, as I ran into more and more ruins around the neighborhood I began to seriously wonder why someone built and old sidewalk and then left it in the woods. I know this post was a bit long. I hope someone reads it. To answer Bob Andreocci, I am fairly certain Park Avenue was part of the Herrick’s District. As another side note the this area. My brother’s mother in law grew up living at 297 Park Avenue. There was only one house between her home and the LIMP. She told me as a young girl she would sleep in the upstairs bedroom. She said the headlights from cars heading west on the LIMP would shine into her room as they came up and over the Willis Avenue LIMP bridge. The Park Avenue school stood until the mid to late 1970’s, and was destroyed by fire. When the Town expanded Albertson Park they build new baseball fields. Although the Town of NH uses their highway yard on LIMP right of way, the actual LIMP northern edge ran up what is today the third base foul line of the little league field. Sorry guys, I know, I have been a little excitable today. I did just visit the Town of North Hempstead driveway on the LIMP old ROW. I went to examine the fence between the old Park Ave School and LIMP. There is no remnant there of any old fencing. It is not exactly new fencing. But it is all standard wood stockade fencing or chain link. Herricks school district is one of LI’s oldest districts(1813). Park Ave school was definitely in the Herricks district. The school closed down in 1971 and became a Boces until torn down for new housing. They closed down the school for economic reasons. The Searingtown elementary school off of I.U. Willets Rd was opened in 1951 to serve Albertson and Searingtown. The Herricks and Mineola school districts were divided by Willis Ave from Hillside Ave basically to the Northern State Parkway. This split Albertson and Williston Park in half. It must of been real hard for Albertson students who lived on the other side of the Motor Parkway to get to school. No wonder they had problems with trespassing and damaging the fences thus the need for a bridge or subway.